Blue Rock Thrush (Monticola solitarius). Taken at Extremadura, Spain, on November 14th 2018. A large, slim bird with a long bill. The male is a dull blue-grey with dark wings. The female is dark brown, vermiculated below, with a dark brown tail. The genus Monticola was formerly placed in the family Turdidae, but molecular phylogenetic studies have shown that the species in the genus are more closely related to members of the Old World flycatcher family Muscicapidae. It is mainly found around the Mediterranean, and also on the Iberian peninsula. A rare vagrant in the British Isles. It breeds in rocky, precipitous habitats on coasts, in mountain ravines, rocky mountainsides, stone quarries and even buildings at lower altitudes. 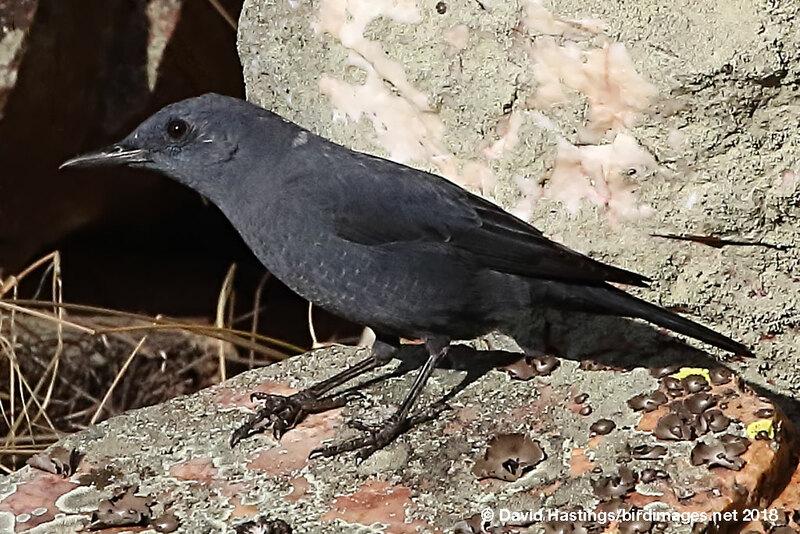 The Blue Rock Thrush is usually wary and difficult to approach.